Why were so few jobs created during the aughts? In net terms no jobs at all were created, but even if you exclude the post-bust years the aughts saw a net increase of only 7 million jobs compared to 22 million in the 90s. What happened? 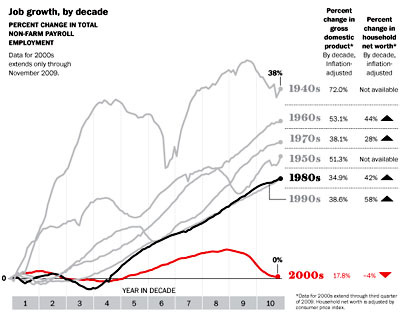 wasn’t a rise in job destruction, which was actually lower than in the 90s, but a lack of job creation. And the engine of job creation is small businesses. Dominant firms can hurt job growth by using their power to hamper the ability of start-ups and smaller rivals to bring new products to market. Google has been accused of doing this by placing its own services—maps, price comparisons—at the top of its search results while pushing competitors in those services farther down, where they are less likely to be seen—or in some cases off Google entirely. Google, however, is a Boy Scout compared to the bullying behavior of Intel, which over the years has leveraged its 90 percent share of the computer microchip market to impede its only real rival, Advanced Micro Devices, a company renowned for its innovative products. Intel has abused its power so flagrantly, in fact, that it has attracted an antitrust suit from New York State and been slapped with hefty fines or reprimands by antitrust regulators in South Korea, Japan, and the European Union. The EU alone is demanding a record $1.5 billion from the firm. The job growth of the 80s and 90s, Lynn and Longman suggest, was largely powered by companies that were founded in the 70s — companies like Apple, Microsoft, Oracle, and Genentech. By the time the 2000s rolled around, consolidation was largely complete and the pipeline of small, innovative companies was drier than it had been in decades. I agree. One of the pathologies of modern conservatism — a pathology that’s shared more often than I’d like by mainstream liberals — is that they’re pro-business, not pro-free market. The difference is critical. Pro-business means passing laws that your business pals like, and as economists since Adam Smith have observed, what businessmen mostly like is lack of competition. The operation of a true free market, conversely, depends crucially on competition and plenty of it. And just as crucially, that requires government intervention to prevent a few behemoths from taking over every sector of the economy. Keeping a free market free takes a lot of work. If Lynn and Longman are right, we need to start doing that work again. It’s time for economists to start seriously debating whether our sputtering job machine is due in large part to our love affair with big business.